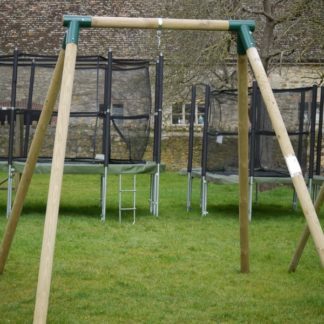 Picture shows the Orchard double swing with 3m slide, the swing attachments are not included in the price. See swing accessories for options. 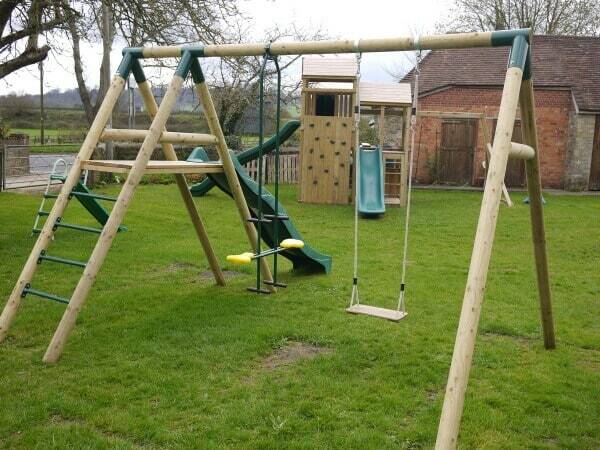 The Orchard Double Swing with 3m Slide and Platform is designed and built in our own workshop, and is one of the few timber frames that will take adults as well as children, so your children will grow into it. It is made from top quality 4″ tanalised timber, Radiata pine, checked for strength and longevity, which helps to reduce “shakes” and splinters, and comes with a 10 year guarantee from rot. We use heavy duty Metal Swing Brackets and Swing Hooks and galvanised bolts. The platform is made from decking boards. 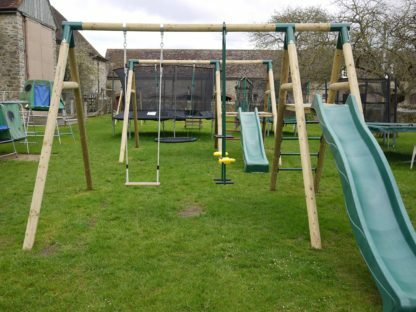 The slide is injection moulded HDPE which has excellent gliding characteristics due to the specialised production processes. Access to the platform is by metal rungs which are powder coated with rounded edges, exterior tube diameter 33mm. 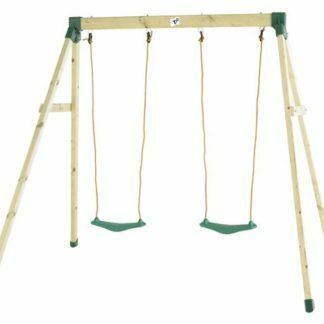 Assembly is easy (the top beam is pre-assembled for you), however the swing assembly requires two persons due to the swing’s size and weight. We recommend using our Swing Anchor Pack to secure your swing rather than digging a hole and cementing in. This is efficient quick and easy, also meaning you can move the swing as necessary. SOLD SEPARATELY . Please leave 2m front and back for the swing pendulum. Supervision of young children is advised. When choosing a seat please ask us for advice if you would like help on the different types particularly where very young infants are playing.